After our drive from Pennsylvania to Vermont, we spent a long weekend visiting extended family in Vermont. We camped in my grandmother’s driveway1, and we had a great time catching up with everyone. The stop was bittersweet, though. My grandmother was diagnosed with ALS about a year ago, and her health had been declining pretty rapidly. She ended up passing away on our last day there. 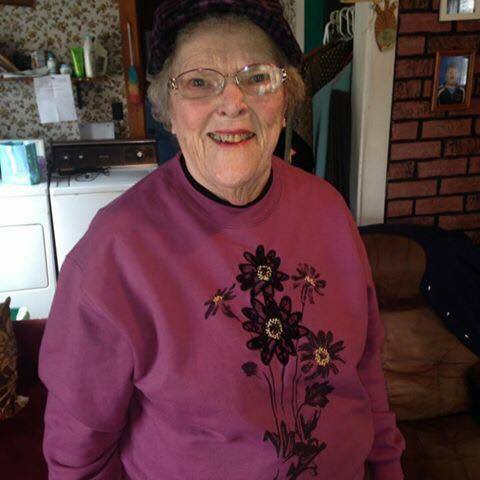 We were incredibly fortunate to have been able to see her before she passed, and while it was hard to say goodbye, it was comforting to know that she passed peacefully surrounded by her family. 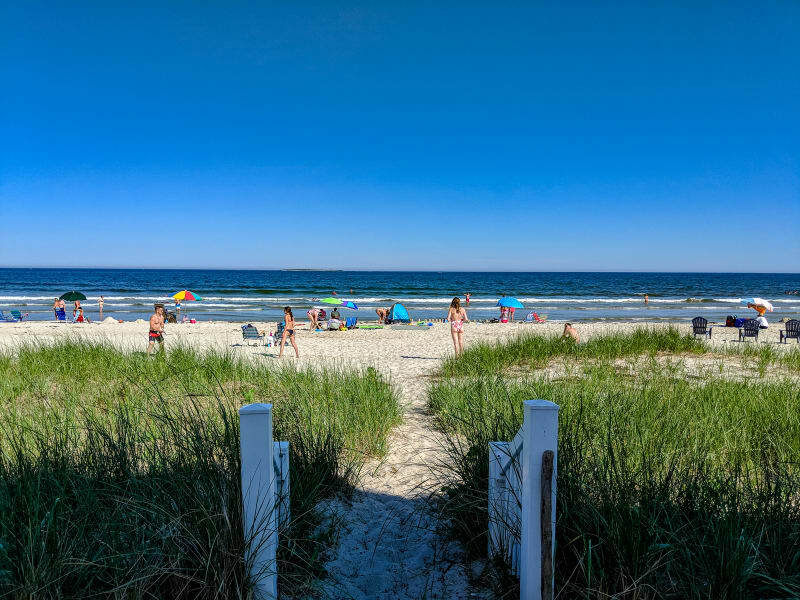 After Vermont, we headed to Old Orchard Beach, Maine, to spend the rest of the holiday week with my immediate family. Sushila and I camped at a nearby park, and my family rented a little cottage on the beach. We had beautiful weather there, and the water was warm enough to swim. A highlight of the stop were the fireworks for July 4th. The town put on a show over the pier; however, many people staying on the beach set off their own fireworks as well. It was great to sit on the beach, look in either direction, and see the sky lit up with color. 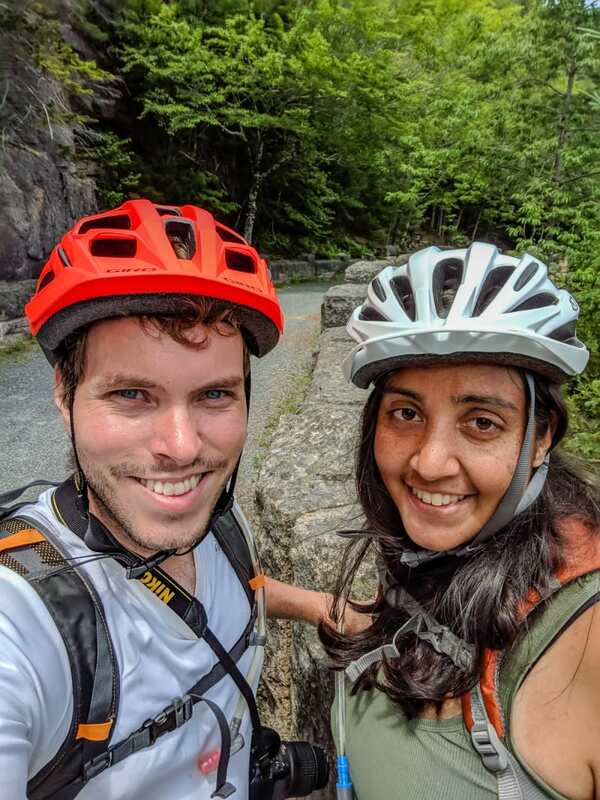 As the week came to a close, my family headed home, and Sushila and I traveled on to Acadia National Park, located about three hours further north along the coast. 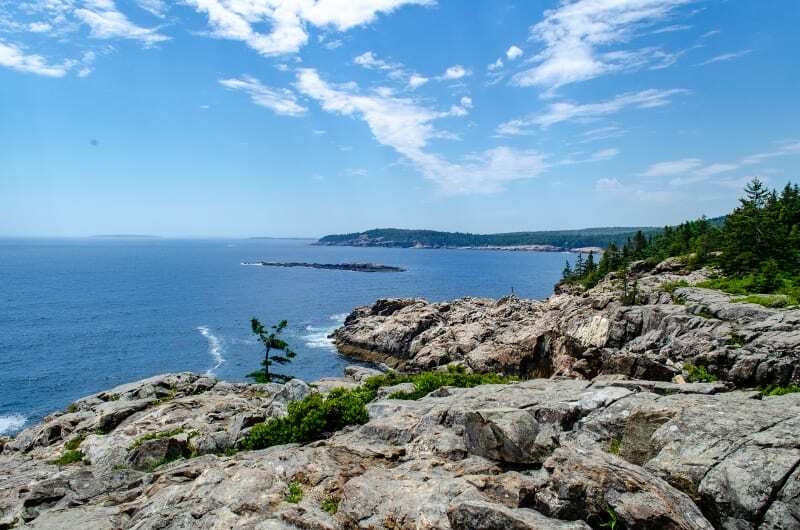 The majority of the park is located on Mount Desert Island, however, there are also sections on the neighboring peninsula and on some of the islands. 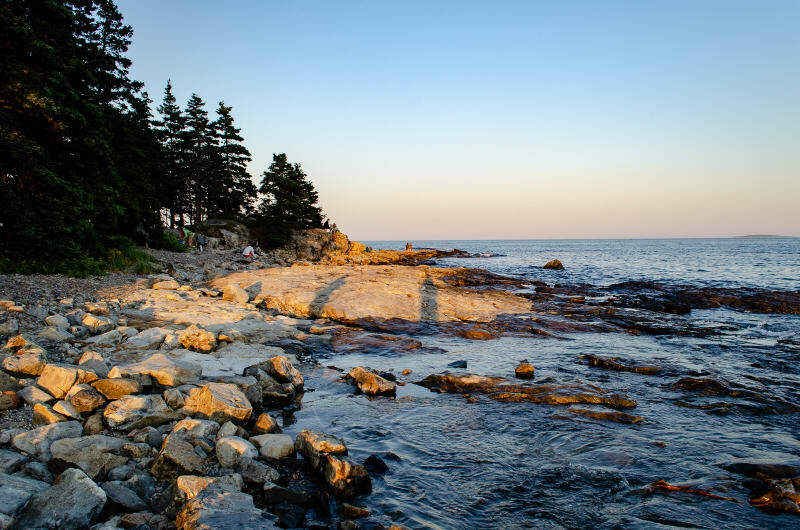 Most of the attractions, as well as Bar Harbor, the best known town in the area, are located on the eastern half of the island. The western half, known as the quiet side of the island, is less densely packed, and that’s where our first campground was located. We stayed in Seawall campground, which is one of two in the park that allow RVs. This was actually the very first campsite I booked for our trip - before we even owned the truck or RV. My family planned the Maine trip last winter, so that set our schedule for Maine, and since we were going to be there during the busy season, I booked early. It was also our first pull-through site, which are theoretically much easier to park in. When I booked it, I wasn’t sure how my backing-up experience would be at this point in the trip, so I didn’t want to risk it. It actually ended up being one of the harder spots to park, though. The site had a max-length of 35’, and it was definitely a hard limit. 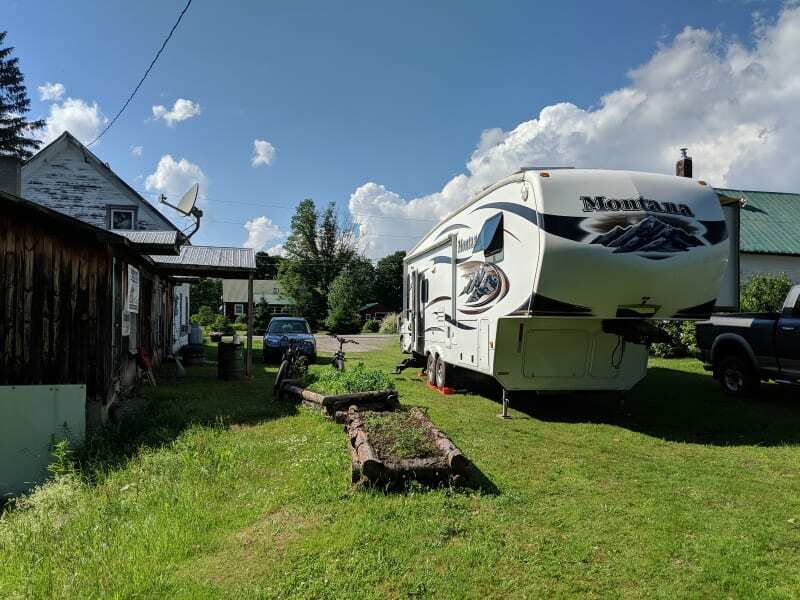 Since our RV is 33’, we filled the space pretty much completely, and to hitch and unhitch the truck, I had to drive into the site across from us and block the entire road. To top it off, the pull-through was at a 90 degree angle from the road, so it took a lot of maneuvering to actually get lined up in the site. We managed it, though. The site was a bit cramped, but there were enough trees that we didn’t see our neighbors too often, and they had free firewood, so we were able to make a fire pretty much every day there. 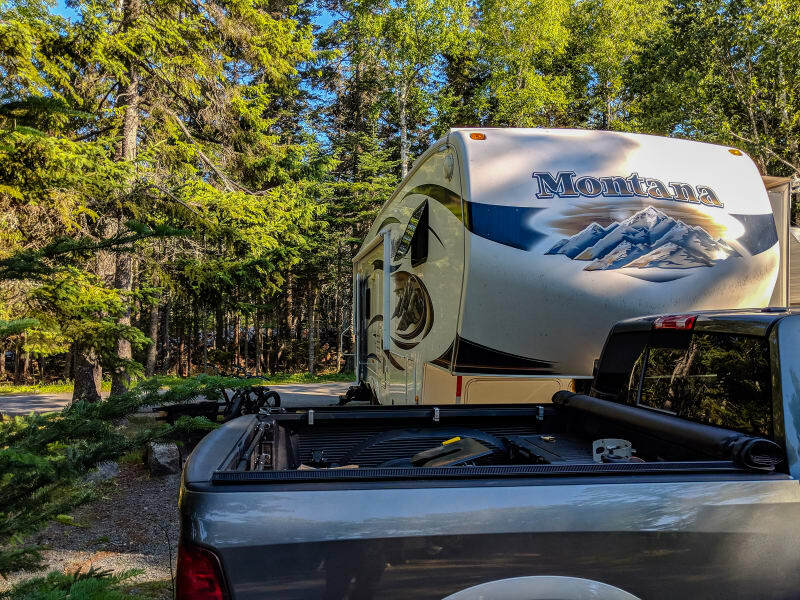 We spent 5 days at the campground and used it as our base for exploring Mount Desert Island. 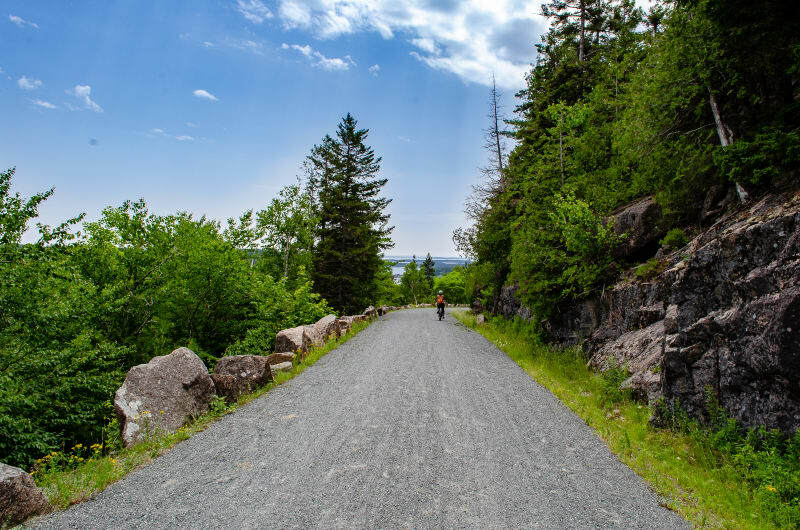 Right across the road from the Campground is Seawall (what the campground is named for) which is a natural seawall formed from granite slabs and loose boulders. 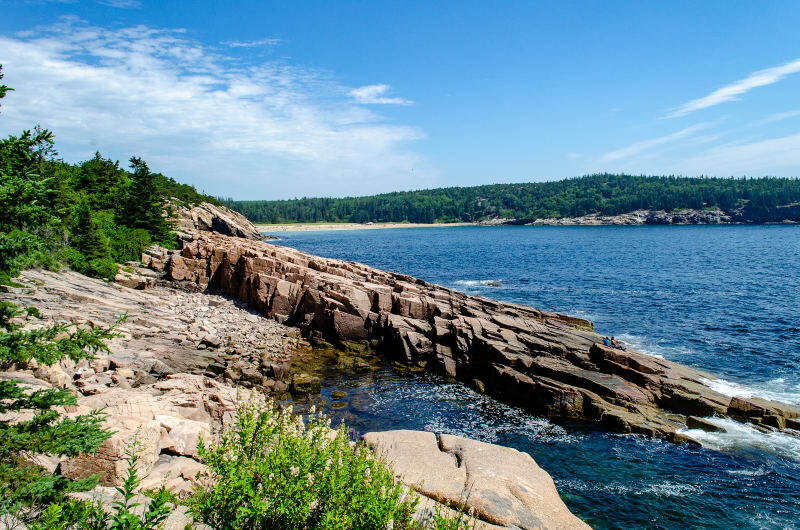 Acadia has a very distinct coastline formed by all of this granite rock from an ancient volcano. Because the granite is so hard, it erodes very slowly, so much of it is still present compared to a lot of other locations on the east coast. We rode our bikes over to check it out after getting settled in to the campground, and we had some great views of the sunset. The next day we set off to get acquainted with the park. We started with the Park Loop Road. 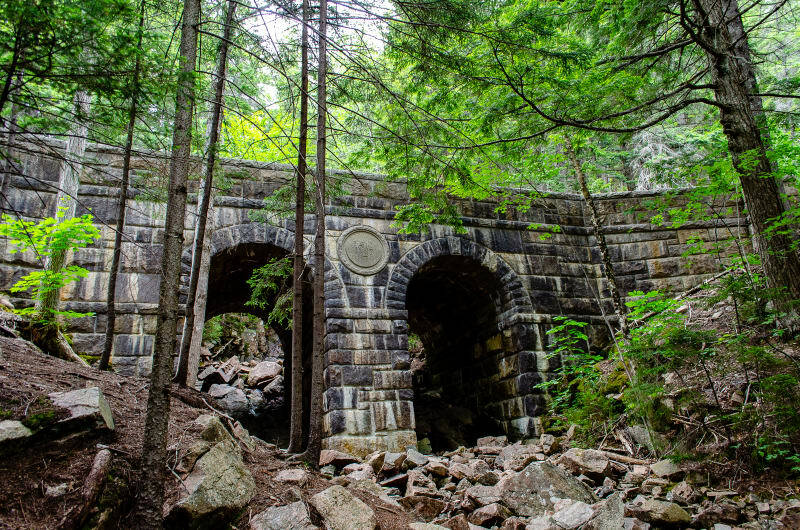 It’s a one-way road that runs around the perimeter of the park on the eastern half of Mount Desert Island. 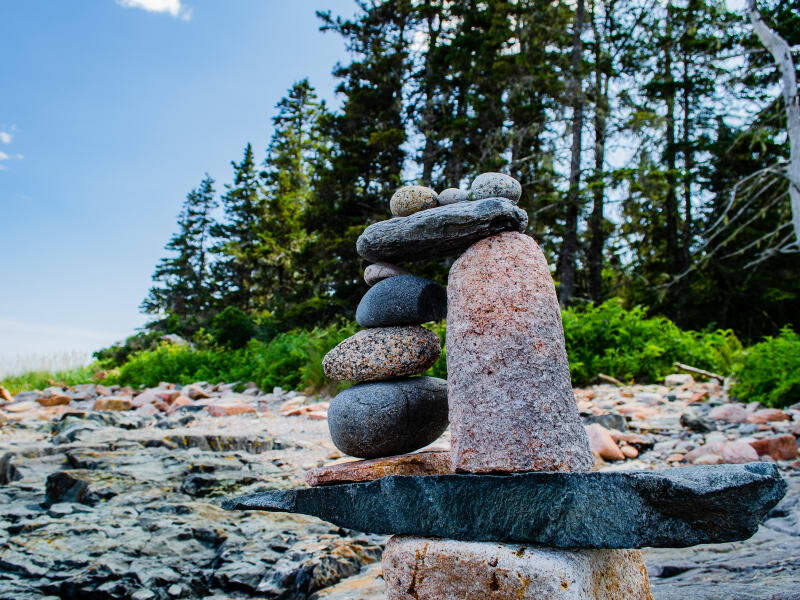 It passes many of the park’s most notable sights - Cadillac Mountain, Jordan Pond, Sand Beach, Thunder Cove - and it follows the coast of the island with beautiful views of the shoreline and water. Our first stop on the loop was the Wild Gardens of Acadia. 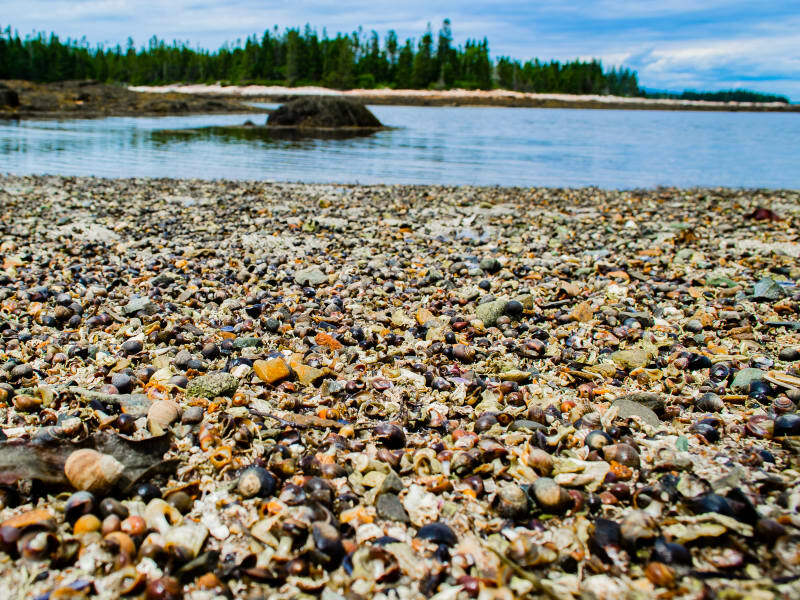 It’s a preserve that showcases the park’s many plants; while Acadia takes up less than 1% of the area of Maine, it’s home to over 50% of all the native species in Maine. Over 300 are present in the Gardens. There are paths that lead through the garden, and the plants are labeled and grouped into the various ecosystems you’ll find in the park. Sushila and I didn’t have any hope of remembering all of them, so we decided to focus on learning the trees. I’m sure we forgot some, still, but we did learn to identify multiple varieties of Birch, Hemlock, Spruce, and Pine, and we tried to pick them out as we explored the rest of the park. After that stop, we headed on to Sand Beach. It was a warm, sunny day, so the beach was completely packed. We weren’t planning to swim, but across the beach was the Great Head trail and Gorham Mountain. One of my former co-workers, Doreen, had recommended the two trails, and they were located in a way that allowed them to be combined into a nice loop (along with the Ocean Path trail). Doreen didn’t let me down; both trails were great. 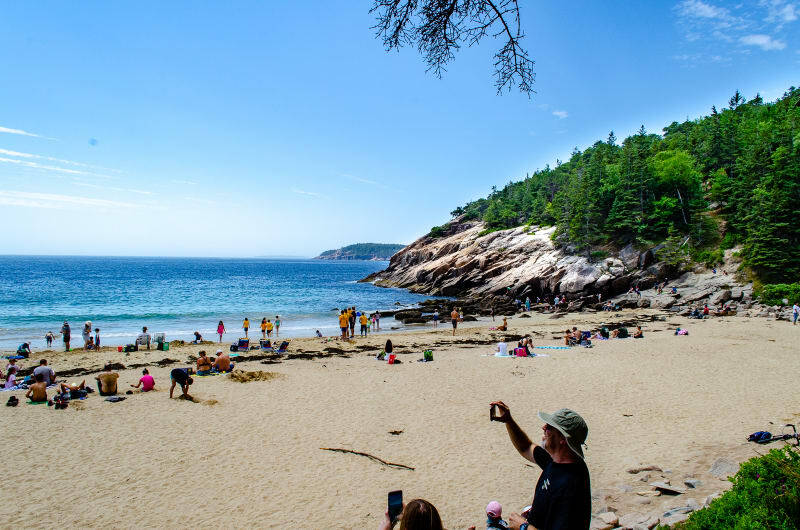 Great Head looped around a peninsula on the far side of Sand Beach, and it had great views of the beach, coastline, and eastern peaks of Mount Desert Island. 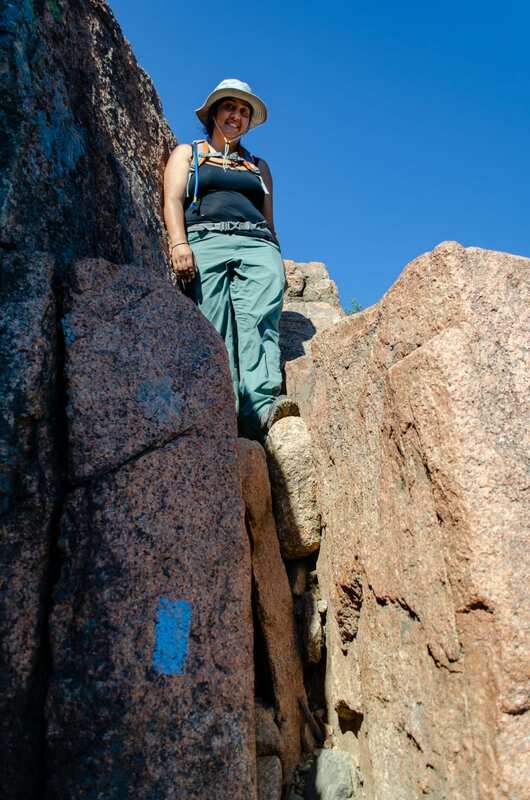 It was very rocky, but we later discovered that that is pretty standard for Acadia hikes. Gorham Mountain had an easier trail to follow, but it had significantly more elevation, too. The views at the top were great, though, with Cadillac Mountain behind us and the ocean in front. We finished the hike and headed back to our truck to continue the Park Loop Road. There were some really pretty overlooks, and there were plenty of places to get out and walk around and climb on the rocks or sit on the beach. Toward the end of the loop were Cadillac Mountain and Jordan Pond, but we were saving those for another day. 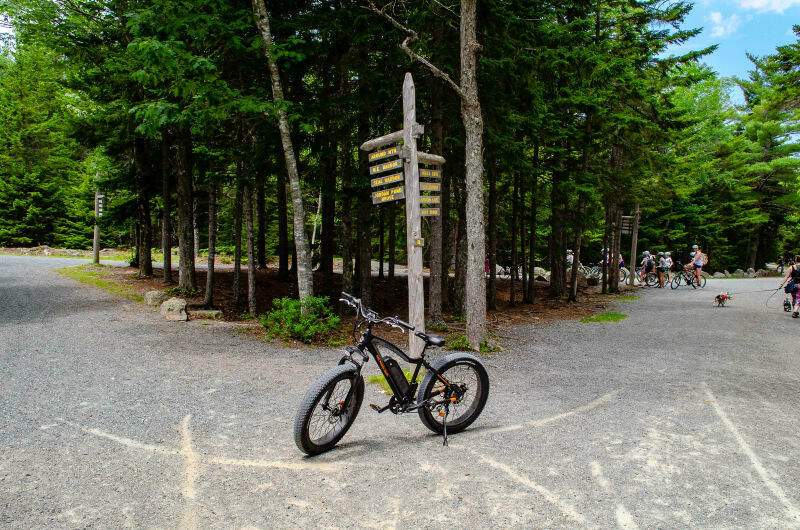 The next day, we took out our bikes to ride on the Carriage Roads. 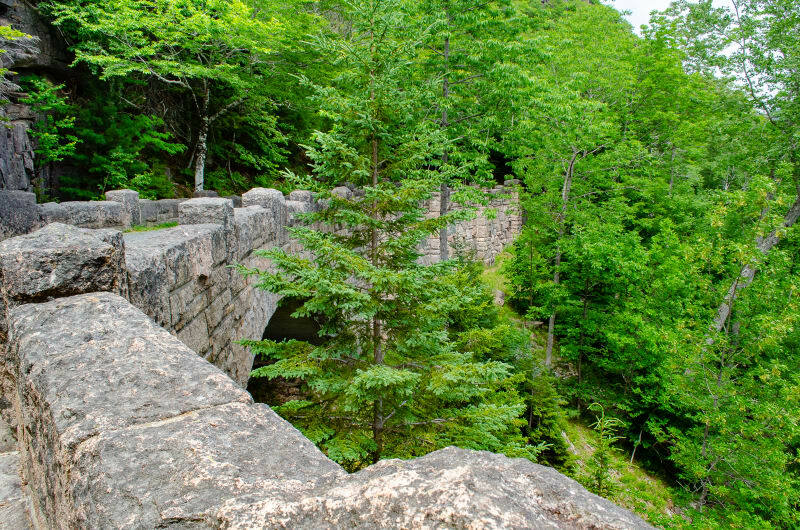 They are a group of over 50 miles of packed gravel paths that traverse the park, and they were originally built by John D. Rockefeller, Jr, in the early 1900s. The Carriage Roads were one of the primary things I had in mind when we decided to buy our bikes, and I’m really glad we had them. Riding was definitely one of the highlights of the trip. We started our ride near Eagle Lake and headed toward the southern end of the island. We continued on the Around Mountain road and looped back to the start. All in all, it was about 15 miles, and it was a challenging ride. There was significantly more elevation change than I was expecting, especially on the Around Mountain road, but the views were spectacular. Having the e-bikes definitely paid off here since we would not have been in good enough shape to do this ride otherwise. After our ride, we headed in to Bar Harbor. The primary reason was for cell reception; most of the island is pretty lacking in cell coverage (with high-speed data, anyway), and Sushila had a presentation to give for work. Luckily, Bar Harbor had great coverage and high speeds, so we found a quiet spot to park, and Sushila gave her meeting from the truck. After the meeting, we wandered around the town a bit. I had heard it was busy and touristy, but it didn’t really feel that way. We stopped at Atlantic Brewing Company for a beer flight and some food, and then we walked along the harbor. We got lucky, and it was low tide while we were there. 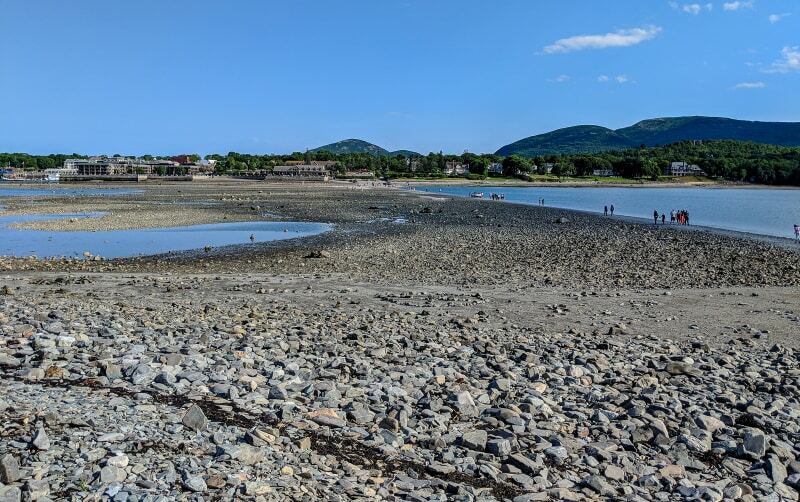 At low tide, a sandbar is exposed that allows you to walk across to neighboring Bar Island. It was a nice walk, and the view of Bar Harbor from the Island was great. 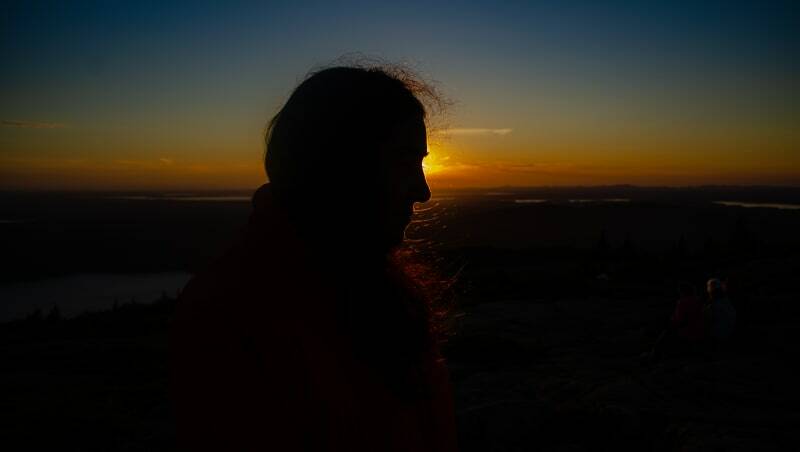 Acadia’s Cadillac Mountain is known for being the first place in the US to see the sun rise each morning, so we had to do that while we were there. Technically, it’s only true from October through March, so we weren’t really going to be the first people to see the sunrise, but it was close enough for me. 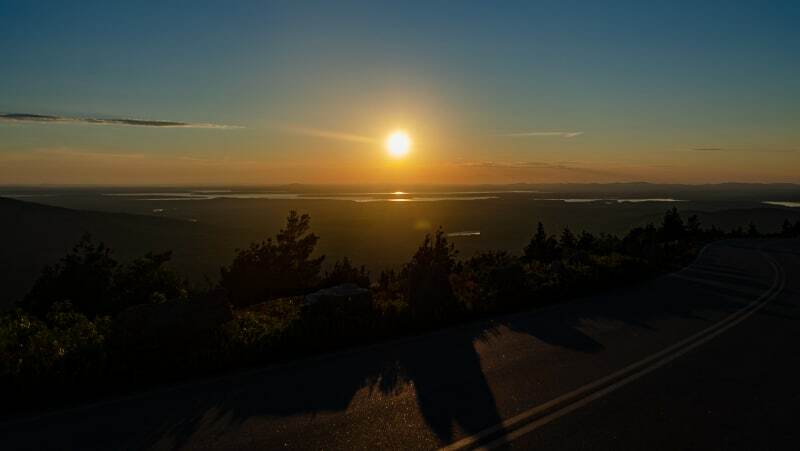 Since you can drive to the peak of Cadillac Mountain, it’s a very popular activity in the park. It’s recommended to arrive around an hour early to find a parking spot. Sunrise was at 5 am, and it was a 30 min drive to the mountain from our campsite, so we had to wake up pretty early. We arrived in time, though, and we snagged one of the last spots in the main parking lot. You can also park further down the road and walk, but it was cold and we were tired, so I’m glad we didn’t have to do that. Since we had a while to wait, we packed our chairs and camp stove and made breakfast while we waited. I was surprised that we were the only ones (at least that I could see) who had any food at all. There were quite a few people with sleeping bags, though, which made me regret not bringing ours. There were also quite a few people who were clearly unprepared for the morning, walking around in shorts and a t-shirt and looking miserable. It was very cold, even in July. We got lucky and had a really clear morning, so we could see all of the surrounding area. It was a really beautiful view, and the sunrise was amazing. I definitely recommend doing this for anyone who visits the park. After sunrise, we headed back to the campground for a long nap. When we finally woke up again and got moving, we decided to stay near the campground and see some sights in that area. Some of our campground neighbors recommended visiting Wonderland, which was just a mile down the road, so we did that first. We packed a picnic lunch and biked over. It was an easy hike that led to a rocky beach similar to Seawall; however, this one was quite a bit bigger. We were there at low tide, so we were able to walk along the granite rocks and explore the tide pools left behind by the retreating water. The pools, and the exposed beach, were all completely covered in snails and barnacles. After exploring, we ate our lunch and moved on. In the afternoon, we drove to a nearby hiking spot. We had hoped to do the Valley Cove trail which runs along the entrance to Somnes Sound; however, the cliffs above the trail happen to be a breeding spot for Peregrine Falcons, so the trail was temporarily closed. Instead, we hiked the Flying Mountain trail. It ended up having great views of the sound entrance from the peak, and it lead to a nice, secluded beach along the sound. We stopped by Echo Lake on our way back. It’s another one of the swimming spots in the park, but it was a bit cloudy and cool while were there, so we just relaxed on the beach before heading home for dinner. Friday was our last day staying on Mount Desert Island, and we decided to visit Jordan Pond. It’s one of the more famous park sights, so it felt like a must-do. A park ranger had also recommended hiking South Bubble Mountain, which rises along the edge of Jordan pond, so we decided to start our day there. 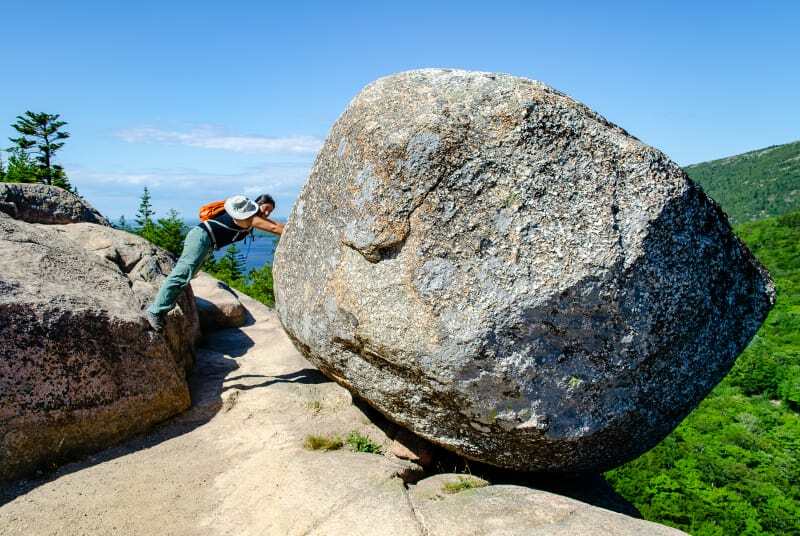 South Bubble Mountain is famous for Bubble Rock, a glacial erratic 2. We hiked the north slope of the mountain which was a relatively easy trail. We arrived at Bubble Rock, and surprisingly, there were very few people there. With nobody else around, we had some fun posing with the rock which is precariously perched along the edge of a cliff. We continued on to the mountain peak, and we were treated to a view that ended up being one of my favorite of the entire trip. We were feeling pretty good at this point, so we decided to take the south slope trail back down the mountain. A ranger had warned us that, due to the way glaciers carved the area, north slope trails tended to be easier and south slope trails tended to be harder, and, at least in this case, it was shockingly true. The start of the trail was gentle enough, but it immediately drops to a steep, narrow, rocky path. There were a couple points where we almost gave up and went back, but we eventually pushed on and made it down the mountain. It was the hardest hike we did in the park, but we ended up really enjoying it. 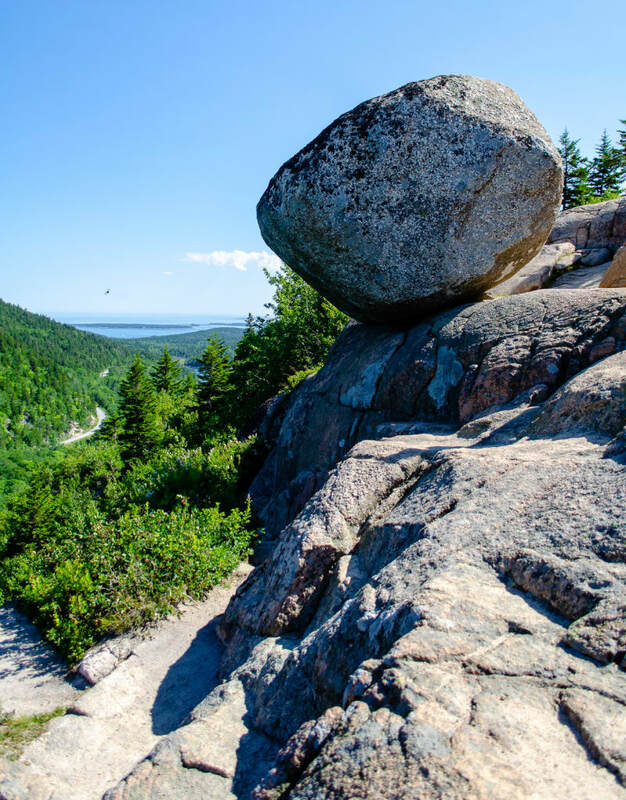 I have a feeling it was like a baby version of the Precipice or Beehive trails (which we skipped), so if we ever make it back to Acadia, we’ll definitely want to give those a try. The bottom of the trail connected to the Jordan Pond trail, which loops around the pond. We followed it around, and at the south end, we stopped at Jordan Pond House. They serve popovers which are light, hollow rolls served with butter and jam, and afternoon popovers and tea are the Jordan Pond House tradition. The popovers were delicious, and we ended up staying for dinner since we were pretty hungry at this point. After dinner, we finished the pond loop and headed back to the car. As we drove out of the park, we passed by Cadillac Mountain again. It was only 30 minutes until sunset, so we spontaneously decided to stop and watch the sunset from the peak as well. We drove back to the peak, only to discover that the peak is not actually a great viewing location for sunset. We waited a bit, and finally decided the view wasn’t really worth it, so we headed down. As we left, we realized that the peak wasn’t actually where people went for sunset. It turns out there is another, lower parking lot with the best views. Of course, that lot was already full, but there was parking space along the road just below it, so we stopped there and waited. 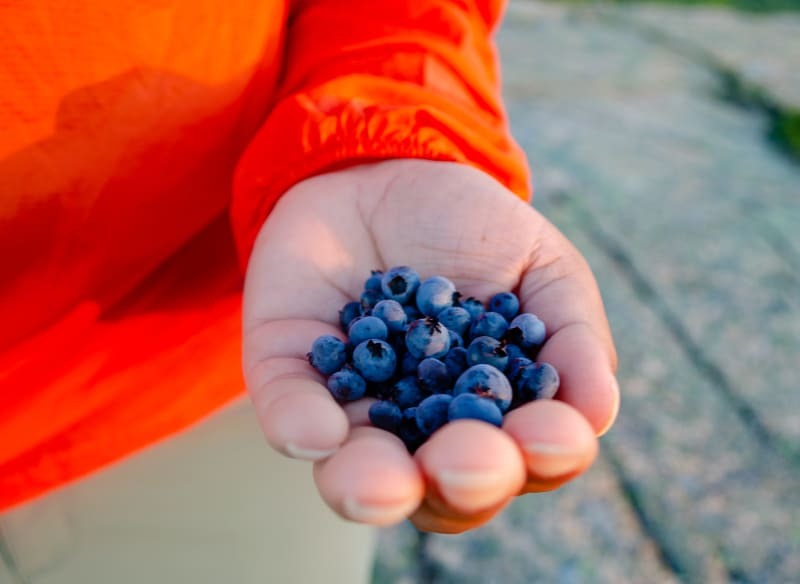 The sunset was beautiful, and there were wild blueberries where we were sitting, so we picked those as well. It was a great way to end out stay on Mount Desert Island. For the last few days of our trip, we left Seawall campground and Mount Desert Island and headed to the Schoodic Peninsula. 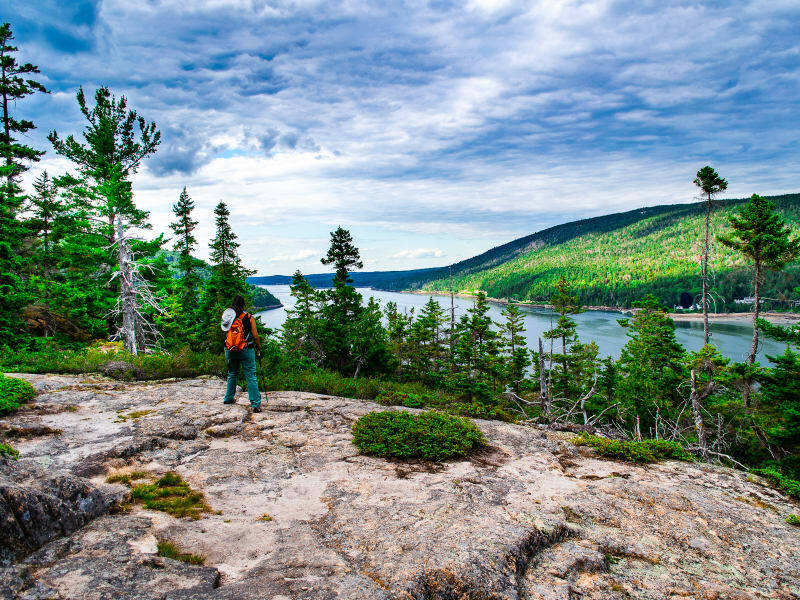 It’s still within Acadia National Park, but it’s on the main land east of the island. 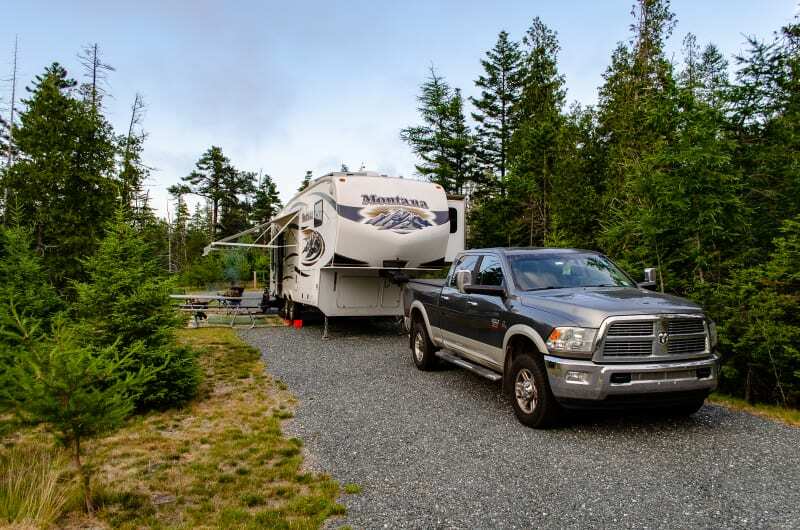 The main reason we ended up here is that, while researching the park, I had come across tons of great reviews for this campground, and I really wanted to try it. It did not disappoint. It is the best campground we’ve stayed in so far. It was also a pull-through site, but this one had tons of space and was angled for easy entry and exit. The campground was immaculate - the bathrooms were cleaner than our own - and they had great wifi (at least by campground standards). After chatting with the campground hosts about it, we learned that the entire campground was built and donated anonymously to the park. It’s also relatively new (I believe they said it opened 3 years ago). If you’re ever in the area, I really recommend staying there. It was also a full-hookup site (we were boondocking at Seawall), so we had a chance to flush our tanks, do some laundry, and take care of other chores. Schoodic Peninsula also has a park loop road and carriage road system, so we took out our bikes and used them to explore the area. There were nice stops along the way, including Schoodic Institute which supports research and education in the park. 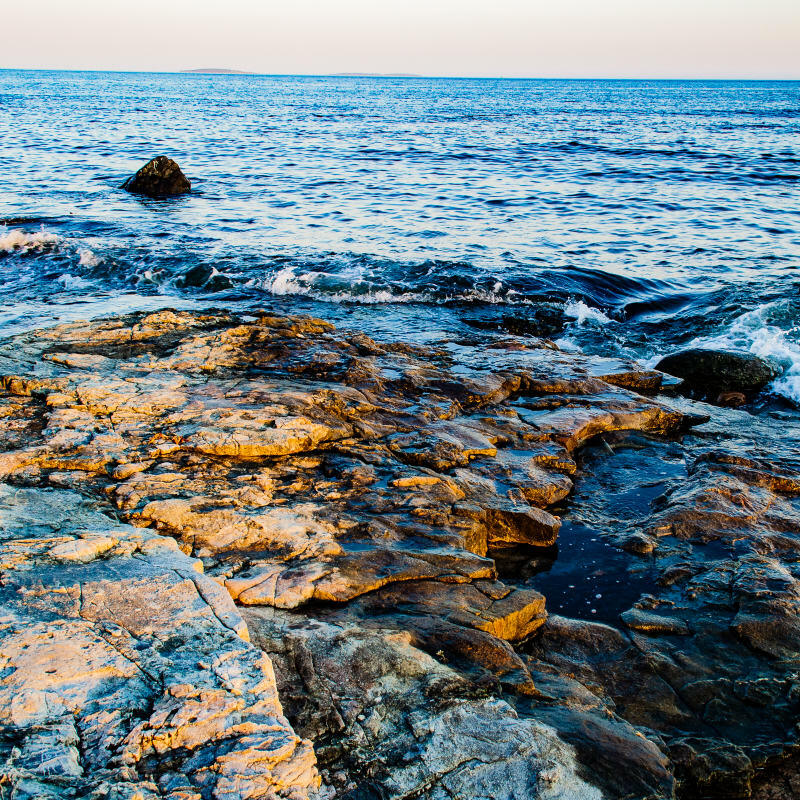 The highlight was Schoodic Point, though. 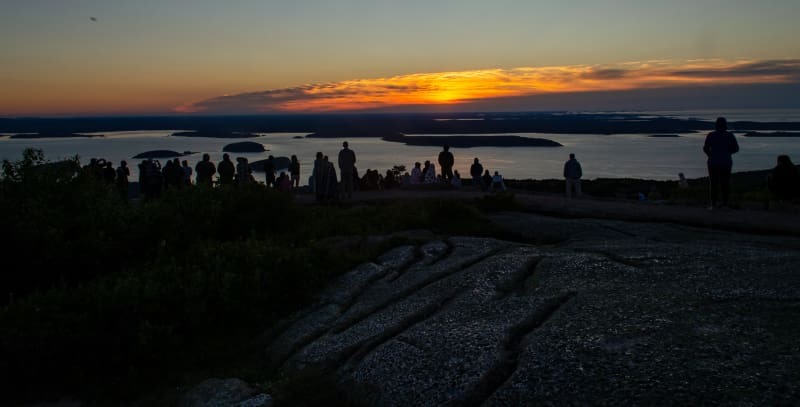 It’s at the southernmost tip of the peninsula, and it has great views of Mount Desert Island and Cadillac Mountain. We had cloudy weather while we were there, but if it were clearer, it would be a great spot to watch the sunrise as well. All in all, we really loved Acadia. The scenery was beautiful, and there was more than enough to keep us busy for an entire week. We were there in mid July, so it was pretty busy, but despite that, we still did a number of hikes and bike rides where we barely saw any other people. It’s a great place to get outside and explore, and if you haven’t been, I really recommend going. A rock that is transported and deposited by a glacier and differs from the type of rock native to the area in which it rests.